Was having a play around with this card last night and I love how it has turned out! 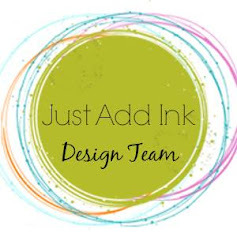 It is a mixture of about five different ideas that I had seen on Pinterest all rolled into one. This was the first time I had attempted the scrolled/rolled flowers and I think that will be my new 'thing'. They are so easy to do and they turn out beautiful. 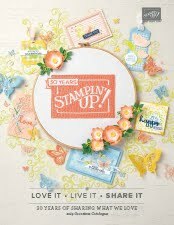 Some of the products used in this card are from the Autumn-Winter Mini Catalogue which finishes up on the 31st July! Make sure you get your all your favourite products from the Autumn-Winter Mini before they are gone forever! Festive Friday #27 Challenge Winner! Yay! I have been chosen as this weeks winner for the Festive Friday Challenge! So excited! Thank you Nicole Derendorf for choosing my card this week. Can't wait to join in this weeks challenge! 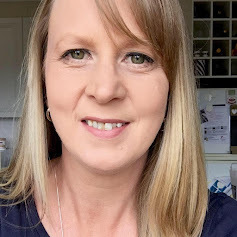 Come and join the challenge at Nicole's Blog! Great way to get those creative juices flowing and by making one or two cards each week you'll have your Christmas cards sorted by the time December rolls around. 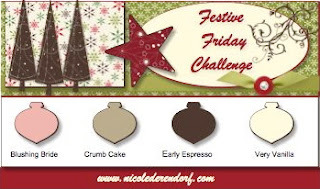 This weeks Festive Friday Challenge over at Nicole Derendorf's blog is a product challenge. The product this week is RIBBON! It has to be used in any way other than just a bow or a knot on your project. I saw this idea on Pinterest a while ago. I've just used varying lengths of Pear Pizzazz Seam Binding ribbon, folded them in half and attached them to the Soft Suede 'tree trunk﻿'. I also had my first attempt at quilling making a star using this technique. 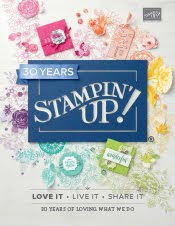 It's that time of the month again for me to make and send my swap for the Facebook group Stampin' Up! Card Swap. To see this group click here. I've used the Attic Boutique DSP #125407, from the Autumn - Winter Mini catalogue. It is beautiful paper and I love the colours that it co-ordinates with. Be sure to get your Attic Boutique paper now as this one will be gone forever on July 31st. I CASEd this one off someone else but can't remeber where I saw it. The punch used is the Postage Stamp punch and the coordinating 1" square punch. They were carried over from the Summer Mini catalogue and are still avaliable. Better go and put this one in the post so that it can make it's way to the US before the end of July. I loved the colour combination of this challenge so much that I made another card to enter in this weeks challenge over at Nicole Derendorfs blog (Click here). I've used the wreath again from Welcome Christmas and the background is rolled with the Music Notes Stampin' Around Wheel. I really love this weekly challenge and am looking forward to seeing the next one will be. Come and join the fun! Well it's Festive Friday time again! This week is a colour challenge using non-traditional colours. I do love a colour challenge. You can go a bit nuts and use your creative flair just making sure you use the colours set out in the challenge. I used the stamp set Welcome Christmas and gave the card a bit of a vintage﻿ feel which these colours lend themselves to very well. I also made up my own embossing powder by mixing some White Embossing powder with some Dazzling diamons Stampin' Glitter to give it a bit of a subtle Christmas sparkle. Not sure if you can see it to well in the photo though. Have a go and join in the fun at Nicole Derendorfs blog (click here﻿) and make a card for this weeks challenge. Great way to get a head start on your christmas cards by making one or two cards for the weekly challenge. I've just updated my stash of Thank You cards for my customers when they place an order and also to put with my retired items when I sell them off. I saw the colour combo of this card on a blog of a U.S demostrator, Lynn Weiss, and fell in love with it. To see the original card click here. 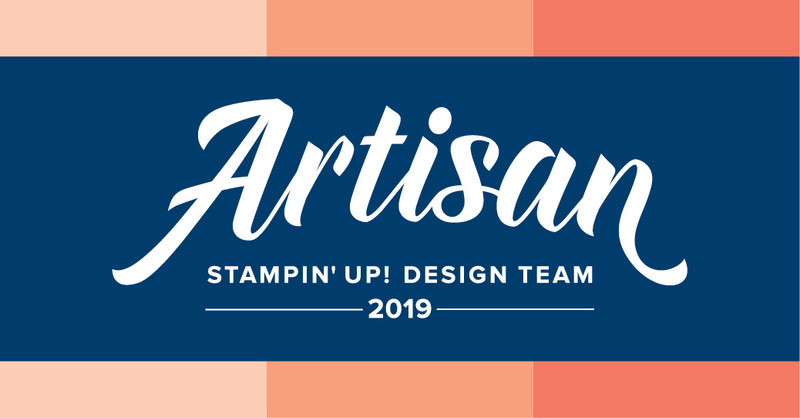 The colours are Regal Rose, Island Indigo and Pear Pizzazz. It isn't a common colour combination but it is very striking. Introducing the Simply Scored Diagonal Plate! 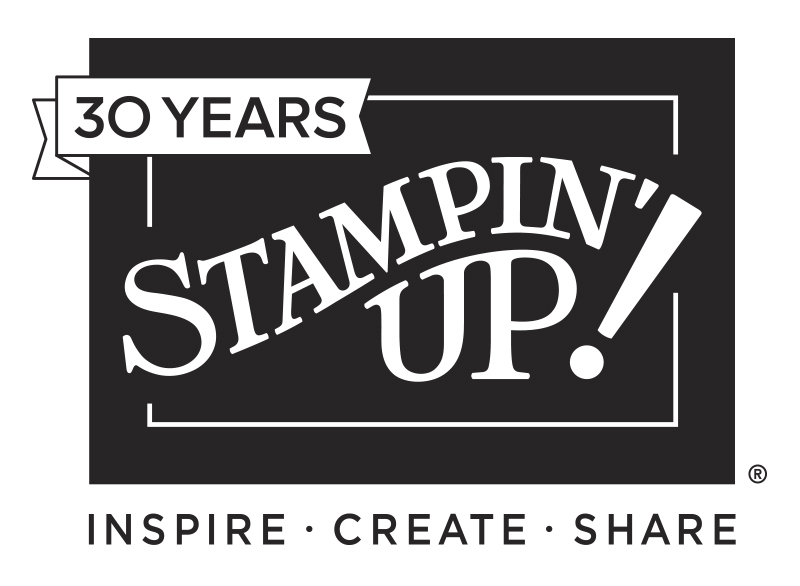 Easily and quickly create distinctive envelopes, boxes and more using the Simply Scored Diagonal Plate, created by and exclusively for Stampin' Up!